Welcome to Gone Gulfin'! 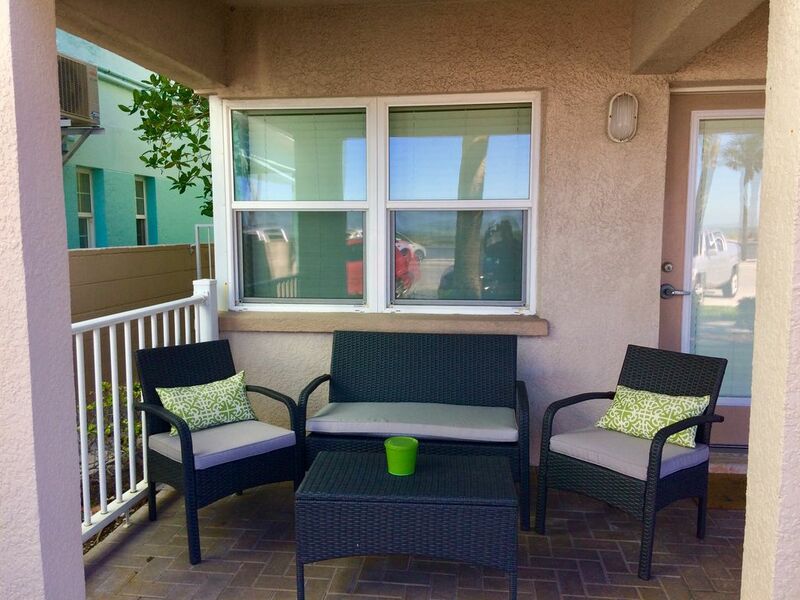 This corner unit provides front door access to the white sandy beach in historic Pass-A-Grille. Enjoy your coffee at sunrise and cocktails at sunset right from the porch. Come and spend a few days relaxing at the beach or the heated pool. The unit is within walking distance to all of the shops, restaurants, and rooftop bars on 8th Ave. Walk to the Merry Pier just one block away to bird watch, rent bikes, go fishing, take a ferry to Shell Key, or enjoy a sunset cruise. -shared beach chairs and pool floats out in pool area. Unit also has a couple of chairs and umbrellas for guests to take to the beach. -St Pete Beach parking sticker. Park right in front of the unit with the use of St. Pete Beach parking pass. -Steps away from the beach, fishing, and unforgettable sunsets. -Walks to restaurants, rooftop bars, shops, and the Merry Pier, and bike and paddle board rentals. Beach, coffee and dog lover. Grew up in Pennsylvania and Virginia but eventually found my home in paradise. high speed wifi (individual, not shared with other units), and Spectrum Select HD TV. The place was clean, great location convienient for beach going,resteraunts,very nice pool,and Quynh has been a pleasure to deal with every time. Wonderful Sunsets! Just a few steps to the beach. Condo had everthing you need. Small complex in walking distance to restaurants and shops. We'll definitely be back. My 10 year old son and I stayed mid August and had a wonderful time. The condo is situated in a perfect spot. It’s about a minutes walk to the beach which can be viewed from the front porch as well as the beautiful sun sets. It’s also a couple minutes walk to all the great restaurants in Pass-a-grille. The condo itself was very clean. Even those hard to get spots like under the sink and the closet where the washer and dryer were kept were all very clean. The condo was stocked with lots of kitchen ware for use. The condo is easily accessed with a keypad or you can use keys for the front doors. We used the keypad so we weren’t worrying about losing the key in the beach. The pool was a wonderful addition which we used frequently. This was also kept very clean. We will hopefully be visiting again soon.